In the 1800s, Nicéphore Niépce, widely credited as the inventor of photography, produced a picture of a table set for dinner for one. In the various reproductions of the original image we’re able to see now, you can make out a bowl, plate, knife, spoon, wine glass, teapot, wine bottle, vase of flowers, neatly arranged set on a white tablecloth. 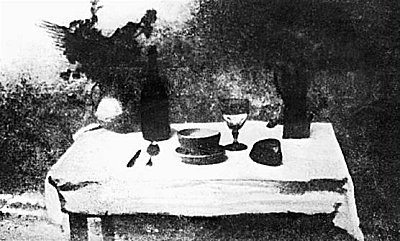 It is among the first examples of a still-life photograph. Looking at the photograph, titled “La Table Servie”, it is easy to trace the evolution of Niépce’s aesthetic interests to the object-centric photography being produced today; there are tensions in the image between the ‘real’ and the ‘constructed’, it contains within it the theatricality of the everyday, the elevation of the banal through the photographer’s lens. These interests have increased with the development of technologies and the disillusion with the world around us – when you don’t see the world you want outside, you have to create the world you want to see. Meatwreck is a photographic collaboration between artist couple Mitra Saboury and Derek Paul Boyle. Saboury completed an MFA at Goldsmiths in 2013 before returning to the US, where she set up a studio with Boyle in Los Angeles. While the two continue to exhibit their individual work, including photos, sculptures, installations and performances, Meatwreck has taken the internet by storm. Using their daily encounters with objects and their relationship as inspiration, the pair create visual puns and paradoxes that are by turns hilarious and gross, but always spontaneous and brilliantly inventive, recalling Erwin Wurm’s One Minute Sculptures. Their feed is a theatre of the domestic: ketchup, bread and, of course, cold cuts are frequent motifs, but really, you never know what you’ll see next with these two. Ahead of their residency and new exhibition at Alter Space in San Francisco, we asked them for a few words about their work and practice. Meatwreck: Mitra and Derek – meat and wreck. Every day is a chance to mess something up together. Meatwreck: Meatwreck is our studio based in Los Angeles. We produce images everyday and post them online. Then we make selections for limited edition prints. How has it changed your practice as individual artists? Meatwreck: Meatwreck has expanded the work we do as individuals. Forcing ourselves to collaborate every day has focused our abilities as image-makers. We direct a project every day, each day’s meatwreck being a melding of our practices. Individual works that we present in solo shows have gotten more refined and expansive (physically) through the process of constantly sharing our work and developing ideas. What can visitors to your new exhibition in San Francisco expect? Meatwreck: Alter Space gallery has invited us to be in residence for a month. We’ve made all the work for the show here, so visitors can expect a clash of the two of us living and loving and digging deep and testing limits.